Agasaga, situated about 12 km from Belagavi, has never witnessed any incidents of burglary, theft or robbery since decades. 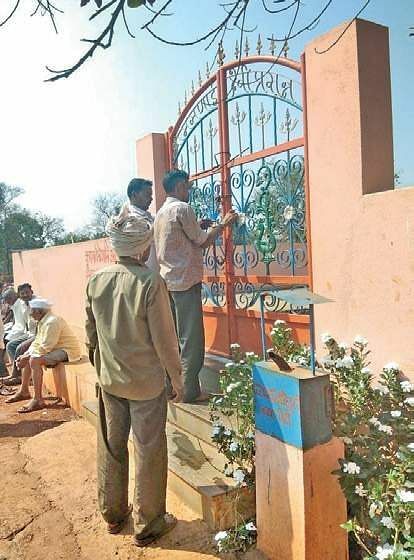 BELAGAVI: IN a bizarre incident, villagers of Agasaga village in Belagavi taluk have locked the temple and challenged the main Goddess of the temple Masanakawwa to ‘unleash her real powers’ and bring back the stolen temple bells. What’s more? They have even set her a 9-day deadline! Agasaga, situated about 12 km from Belagavi, has never witnessed any incidents of burglary, theft or robbery since decades. Villagers used to leave the main doors open, keep their agriculture equipment in the field or in front of their houses without locking them and believed that Goddess Masanakawwa would always protect their belongings. Interestingly, there is no priest for the temple! However, the villagers were shocked when the bells hung inside the temple were stolen on Saturday. They then decided to test the Goddess’ powers. They all gathered in front of the temple, brought a big iron chain, locked the main entrance of the temple and told the Goddess that she must trace the thieves, bring back the bells to the temple if she has real powers. They also told the Goddess that she must ‘settle everything’ within nine days, else they would not come back to the temple nor perform pooja to her. The resolution was passed unanimously and all the villagers have been restricted from entering the temple premises till the goddess finds the bells.